My Sister, Mom and I went out this morning to check on how the new lupines were doing. At first We only saw the several lupine plants from last year. The lupines that were already established from previous years were fully grown and flowering. 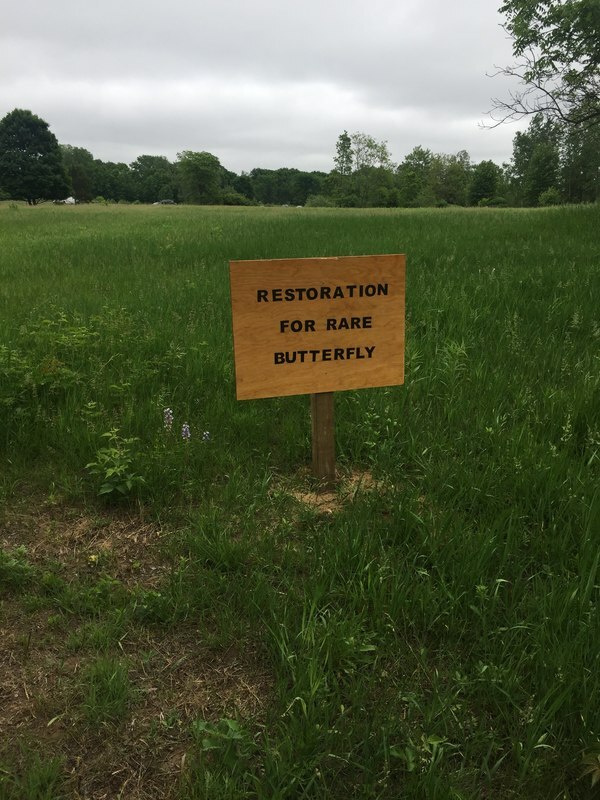 We came to plant Black Eyed Susans (a yellow flower that also benefits the Poweshiek Skipperling, an endangered butterfly that has Michigan populations only in the 100s). The Black Eyed Susans will provide nectar for the Karner Blues after the lupine are done flowering. We planted 25 plants in the restoration area. As we were planting we saw small lupine sprouts low to the ground. They were easy to identity by their radial leaf pattern. Each one was about a foot apart. I was so happy that they came up and now think we should come back and pull out the grass next to each lupine so there is less competition. I also think it is about time to mow the area. Mowing at 6-8 inches above the ground will cut down tall grasses but not hurt the short lupine plants. A wooden sign was also put up to identify my project. I met with Ms. Julian as well as 4 other volunteers for planting the lupine and wildflowers. we collected the seeds and dried them from last summer. Since we did not plant in the fall, the seeds did not get the freeze-thaw effect on their seed coat which would have made it easier to break open once germinating starts. Instead we have to preform scarification on all the seeds to scrape the seed coat a little to crack it or make it thinner. Or else the plant would not grow until after the next winter. We scarified the seeds by rubbing them between two sheets of sand paper. You had to be quite aggressive to be able to break the lupine seeds because their coat is tough. We took turns doing this. Once a group of seeds were scarified they were taken to be planted. Because the birds like this area and lupine seeds, they had to be buried just under the ground and hopefully, they do not get eaten. The volunteers and I used shovels to lift up the dirt, put around 3 seeds in, then press down on the soil with our feet. we used a cross pattern and went in lines to make sure all areas had lupine. We also pulled out any raspberry plants that were in the area to make it look nicer and not block the lupine when it grows. After the lupine was planted, we went over to once volunteer that was mixing sand, clay and seeds of wildflowers for us to disperse to the rest of the site. This was a different method because it was for a larger area. we lined up and walked straight forward while sprinkling the mixture on the ground. All the wildflowers will attract insects which would attract birds as well. The site is right next to a subdivision so hopefully it will get visitors though its paths. Ms. Julian took the extra lupine and tried a different method of planting by soaking them a while to soften the coat then sprinkling them on the ground. Those may have gotten eaten more but it is good to try different ways of planting in case one method was unsuccessful. At the Voorheis-Bersely Site, where lupine will be planted, a prescribed burn was done to replenish the soil with nutrients and cut down the larger plants. It was a great day for it with medium humidity and minimal wind. It only took 30 minutes and was almost over by the time I made it over there. The burn killed the tops of the plants but not the roots or next to the soil. If dug through, there is still green underneath the soot and ash. Burns are important for this type of ecosystem so the woody vegetation is limited and sunlight can still get to the ground After the burn we could see more easily the supplies left from the horse farm that was once there such as barbed wire and cement fence holder. After a few days we could see small plants coming up after the burn. We decided to cover part of the land with lupine but the other with a mix of wildflowers collected from the demonstration garden and ordered online. This is because the variation in the soil type. Lupine likes more sandy soil and that is only in part of the area while the rest has more clay. Hi I just made this website in order to track my progress on my Gold Award. I am currently an ambassador in girl scouts and in my last year of high school. I hope to make a difference in conservation though this project. I would like to study environmental science, entomology and botany in college and this project will help me feel what it is like working in this area of study.